It is a challenge for the poor to overcome the barriers to accessing health services. Membership-based microfinance with associated health programmes can improve health outcomes for the poor. This study reviewed the evidence published between 1993 and 2013 on the role of membership-based microfinance with associated health programmes in improving health outcomes for the poor in South Asia. A total of 661 papers were identified and 26 selected for inclusion, based on the relevance and rigour of the research methods. Of these 26, five were evidence reviews. Of the remaining 21 papers, 12 were from India, seven from Bangladesh, and one each from Sri Lanka and Indonesia. Three papers addressed more than one theme. Five key themes emerged from the review: (i) the impact of microfinance programmes on the social and economic situation of the poor; (ii) the impact of microfinance programmes on community health; (iii) the impact of integrated microfinance health programmes on raising client awareness; (iv) the impact of integrated microfinance health programmes on financing health care; and (v) the impact of integrated microfinance health programmes on affordable health-care products and services. The review provides new evidence on the pathways through which microfinance helps to improve population health and value for money for such programmes. Among countries with large populations in the informal sector, there is a strong case for policy-makers to support these groups in providing access to life-saving health care among the poor. Background: Cognitive impairment, an age-related condition, is often considered a precursor to more serious diseases such as depression/dementia/Alzheimer’s disease. Alzheimer’s disease, which is characterized by cognitive impairment, could have a devastating impact on low- and middle-income countries whose populations are ageing rapidly. The disease has, so far, largely remained neglected by researchers and national health services in India. In view of the growing elderly population and diverse sociocultural and geographical milieu of India, epidemiological data for the condition are desirable for different populations. Moreover, there is a dearth of population-based epidemiological studies on cognitive impairment in the Punjab state of India. Methods: Three thousand and thirty-eight consenting elderly adults aged over 60 years, of both sexes, residing in Ludhiana, Punjab state, India were examined for cognitive functioning, using a modified Hindi Mental State Examination, and a score of ≤25 was considered to be indicative of cognitive impairment. Data analysis included calculations of proportions; odds ratio and their 95% confidence intervals (CIs) were also calculated. The chi-square test and multiple logistic regression model were used to determine the association of cognitive impairment with various sociodemographic parameters. Results: The prevalence of cognitive impairment in the study population was 8.8% (95% CI = 8.06 to 9.54). Increasing age, unmarried/widowed status, illiteracy, unemployment and poverty were found to be independently associated with cognitive impairment. Conclusions: The prevalence of cognitive impairment in this north Indian population of elderly individuals is higher than that found in northern India. With emerging focus on geriatric health services, cognitive impairment, which is a precursor of Alzheimer’s disease/dementias, needs to be included in priority care within the national primary health-care framework. Background: There is a close association between poor mental health status and both poor physical health and decreased productivity. An evidence base on the risk factors for psychological distress in low-income countries is lacking and is much needed to help develop appropriate interventions. We aimed to estimate the prevalence of psychological distress in urban Pakistan and identify associated risk factors and functional disability. Methods: This was a population-based study of 18–75-year-olds in urban Pakistan. The Self-Reporting Questionnaire (SRQ) was offered to 1000 adults to measure psychological distress. The Life Events Checklist, Oslo-3 for Social Support and Brief Disability Questionnaires were used to establish social stressors, support and functional disability. Results: Questionnaires were completed by 880 (94%) eligible participants, of whom 41% of women and 19% of men scored 9 or more on the SRQ (possible range 0–20). Low educational status was associated with high rates of psychological distress. Women had significantly higher levels of distress than men and were less likely to receive practical support. Conclusions: The prevalence of psychological distress was lower in urban Karachi than that reported previously for rural Punjab province, Pakistan. However, in urban Karachi, as in rural Punjab, socioeconomic status seemed to have more of an impact on the mental health of women than that of men. 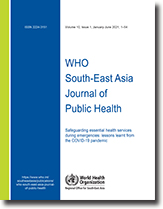 Background: A World Health Organization (WHO) package of essential noncommunicable (PEN) disease interventions was piloted in two districts of Bhutan by non-physician health workers. They conducted risk assessment among patients aged over 40 years who visited the outpatient department of health institutions. Blood glucose was also measured among those who were overweight/ obese (body mass index ≥23 kg/m2) or had a high waist circumference (>80 cm in women and >90 cm in men). Appropriate counselling, treatment and referral were provided to the patients. The performance of the PEN project in detecting and managing noncommunicable diseases (NCDs) and their risk factors was assessed. Methods: All health institutions of Paro (one district hospital and three basic health units [BHUs]) and Bumthang districts (one district hospital and four BHUs), were included in the PEN pilot assessment study. All patients who had presented to the clinics in the pilot districts from 1 June to 31 August 2012 constituted the study population. The data were collected from the clinical form, supervisor’s report and monthly report of the PEN project. The characteristics of patients with an NCD at registration and at the third follow-up visit were compared in a before–after analysis. Absolute changes in the characteristics of patients were computed for those who had completed the required followups during a 3-month assessment period. Results: In a 3-month period, 39 079 patients had attended clinics in the pilot districts. About 10% of the clinic attendees (3818/39 079) were aged over 40 years; of these, 22.6% (864/3818) had a high blood pressure, and 49.7% (1896/3818) were overweight/obese or had a high waist circumference. Screening of overweight/ obese/high waist circumference cases revealed that 26.1% (494/1896) had high blood sugar levels. Out of the 896 patients who were registered on PEN protocols, 13% had >20% risk of developing cardiovascular diseases (CVDs) in next 10 years as per the WHO/International Society of Hypertension risk-assessment charts. Among 444 who had three follow-up visits, high 10-year-CVD risk (>20%) had declined from 13% to 7.3%. Among 400 persons with hypertension, use of medication increased and high blood pressure declined from 42.3% to 21.5%. Among 115 persons with diabetes, use of anti-diabetes medication increased and high blood sugar declined from 68/100 to 51/100. Conclusion: Implementation of the PEN intervention in the primary health-care setting of Bhutan led to improvement in blood pressure and diabetes control, and reduction in CVD risk. Background: The integrated management of childhood illness (IMCI) is a comprehensive approach to child health, which has been adopted in Indonesia since 1997. 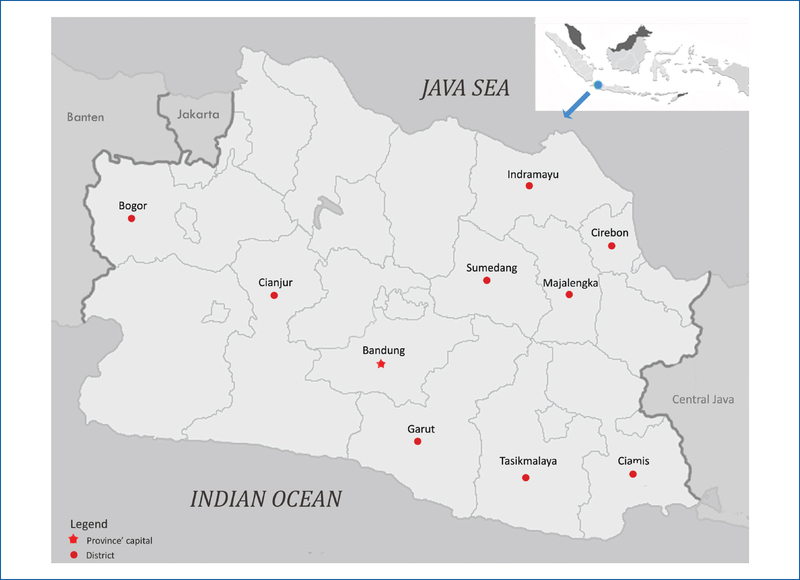 This study aims to provide an overview of IMCI implementation at community health centres (puskesmas) in West Java province, Indonesia. Methods: Data were derived from a cross-sectional study conducted in 10 districts of West Java province, from November to December 2012. Semi-structured interviews were used to obtain information from staff at 80 puskesmas, including the heads (80 informants), pharmacy staff (79 informants) and midwives/nurses trained in IMCI (148 informants), using semi-structured interviews. Quantitative data were analysed using frequency tabulations and qualitative data were analysed by identifying themes that emerged in informants’ responses. Results: Almost all (N = 79) puskesmas implemented the IMCI strategy; however, only 64% applied it to all visiting children. Several barriers to IMCI implementation were identified, including shortage of health workers trained in IMCI (only 43% of puskesmas had all health workers in the child care unit trained in IMCI and 40% of puskesmas conducted on-the-job training). Only 19% of puskesmas had all the essential drugs and equipment for IMCI. Nearly all health workers acknowledged the importance of IMCI in their routine services and very few did not perceive its benefits. Lack of supervision from district health office staff and low community awareness regarding the importance of IMCI were reported. Complaints received from patients’families were generally related to the long duration of treatment and no administration of medication after physical examination. Conclusion: Interventions aiming to create local regulations endorsing IMCI implementation; promoting monitoring and supervision; encouraging on-the-job training for health workers; and strengthening training programmes, counselling and other promotional activities are important for promoting IMCI implementation in West Java province, and are also likely to be useful elsewhere in the country. Background: Management of health-care waste is an essential task, which has important consequences for public health and the well-being of society. Economic evaluation is important for strategic planning and investment programming for health-care waste management (HWM). 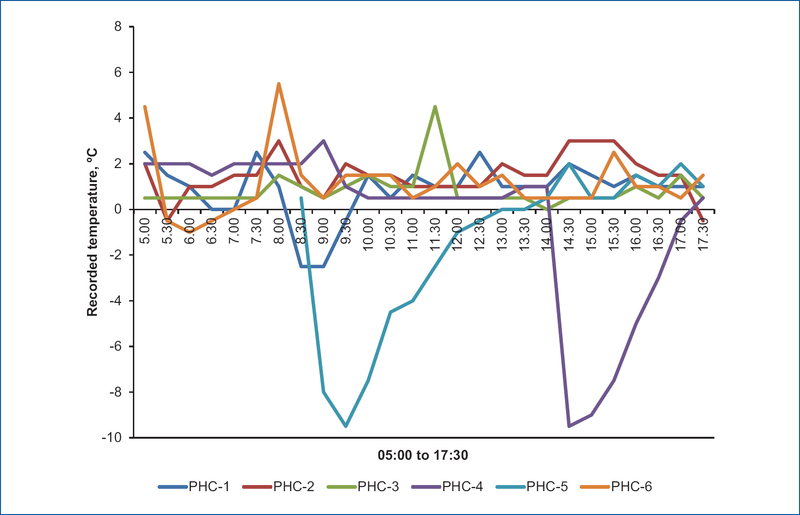 A cost–benefit analysis of an alternative method of HWM in Bir hospital, Nepal was carried out using data recently collected from primary sources. Methods: Data were collected using mixed quantitative and qualitative methods. Costs and benefits were measured in Nepalese rupees. The values of all inputs were costs associated with the alternative HWM. Benefits were defined as the reduction in cost of transportation; money obtained from selling of recycled waste; and risk reduction, among others. 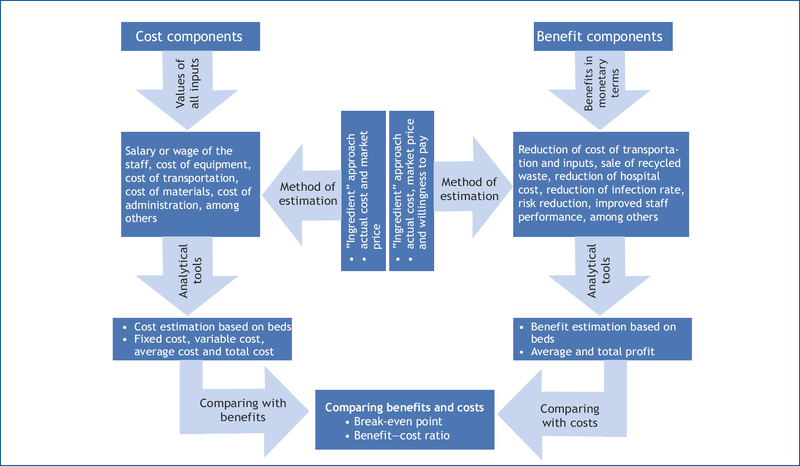 Break-even analysis and calculations of benefit–cost ratio were used to assess the alternative HWM. Results: The alternative HWM reduces the cost of waste disposal by almost 33% per month, owing to reduction in the amount of waste for disposal. The hospital earns 3 Nepalese rupees per bed per day. The results suggest that a break-even point for costs and benefits occurs when 40% of the total beds of the hospital are covered by the alternative HWM, if the bed occupancy rate is at least 68%. If the alternative HWM is introduced in the hospital system, hospitals can reach the break-even point at 40 to 152 beds, depending on their performance in HWM. Conclusions: The results show the economic feasibility and financial sustainability of the alternative HWM. This alternative method of HWM is a successful candidate for replication in all public and private hospitals in Nepal. Background: The incidence of tuberculosis (TB) in the city of Bandar Lampung, Indonesia, increased during the period 2009–2011, although the cure rate for TB cases treated under the directly observed treatment, short course (DOTS) strategy in the city has been maintained at more than 85%. Cluster analysis is recognized as an interactive tool that can be used to identify the significance of spatially grouping sites of TB incidence. 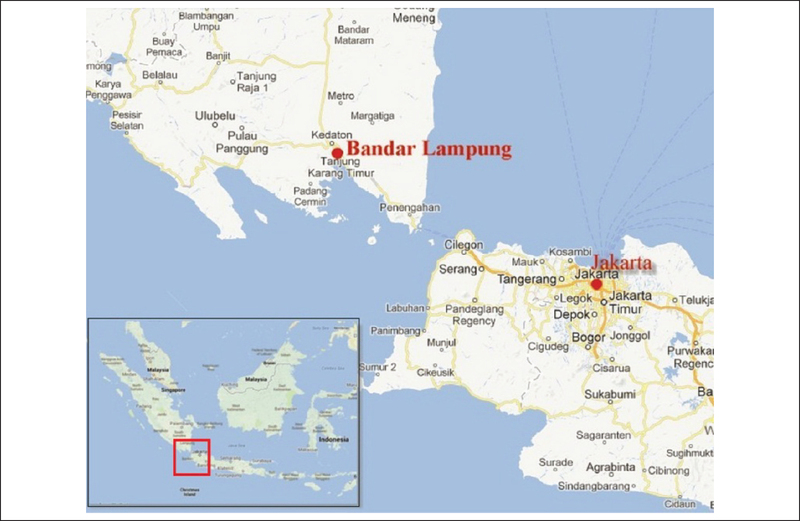 This study aimed to identify space–time clusters of TB during January to July 2012 in Bandar Lampung, and assess whether clustering co-occurred with locations of high population density and poverty. Methods: Medical records were obtained of smear-positive TB patients who were receiving treatment at DOTS facilities, located at 27 primary health centres and one hospital, during the period January to July 2012. Data on home addresses from all cases were geocoded into latitude and longitude coordinates, using global positioning system (GPS) tools. The coordinate data were then analysed using SaTScan. Results: Two significant clusters were identified with P value of 0.05 for the primary cluster and 0.1 for the secondary cluster. Clusters occurred in areas with high population density and a high proportion of poor families and poor housing conditions. The short radius of the clusters also indicated the possibility of local transmission of TB. Conclusions: The incidence of TB in Bandar Lampung was not randomly distributed, but significantly concentrated in two clusters. Identification of clusters of TB, together with its etiological factors such as social determinants, and risk factors, can be used to support TB control programmes, particularly those aiming to reach vulnerable populations, and intensified case-finding. Background: The costs to the individual and to society of psychoactive substance use is of growing concern in Bhutan. This study aimed to assess the relation between the demographic variables of patients admitted to the National Referral Hospital for first-time detoxification and the psychoactive substances used. Methods: The demographic variables and types of psychoactive substance used by 284 substance users were reviewed. Data were collected through patients’ history sheets and admission registers, and analysed through descriptive statistics, one-way analysis of variance and independent t test. Results: The commonest psychoactive substance used was alcohol, followed by cannabis, nitrazepam, dextropropoxyphene, glue (inhaled) and chlorphenamine/ pseudoephedrine/codeine-containing cough syrup. Only 14% of participants were aged 45 years or older. Most patients used more than one substance; the mean number of psychoactive substances used was highest among males, individuals aged 15–24 years and those who were unemployed. Conclusion: Among patients admitted for first-time detoxification, harmful use of alcohol is the most common, followed by cannabis and illicit prescription drugs. Preventive measures should be prioritized on a need-based strategy. The findings of this study indicate that some of these preventive measures should be focused on males, unemployed groups and youth, and should involve raising awareness of harmful use of substances and the services available to treat substance use disorders. India was certified polio free on 27 March 2014. Supplementary immunization activities, in the form of national immunization days, is one of the core strategies for eradication, where oral polio vaccine is administered to children aged under 5 years throughout the country. Oral polio vaccine is heat sensitive and requires maintenance of a stringent cold chain. Therefore, vaccine carriers with ice packs are used in the Pulse Polio Immunization (PPI) programme. This study assessed whether the cold chain is maintained during National Immunization Day in Beed district. A cross-sectional study was conducted at six randomly selected booths, one each from six primary health centres in Georai block of Beed district in Maharashtra. Electronic data loggers, configured to measure half-hourly temperatures, were kept in vaccine carriers throughout the day of PPI. The vaccine carrier temperature was below 8 °C at all six booths; minimum temperature recorded was -9.5 °C, while the maximum was 4.5 °C. The vaccine vial monitor did not reach discard point in any booth. A vaccine carrier with four ice packs very effectively maintains the cold chain required for oral polio vaccine.